Jimmy Howe - THE MASSACRE AT LE PARADIS - HELL IN PARADISE - MAY, 1940. Above are three photographs of Major Jimmy Howe taken on his trip to France shortly before his death in 2005. We are grateful to Jimmy's son Alan for sending us the photographs and for permission to use them on this site. Major Jimmy Howe survived the heavy fighting around Le Paradis to carve out an illustrious career in military music after the war. Major Howe joined the Army in 1933 and saw active service in Palestine in 1938 before being sent to France in 1939 to serve with The Royal Scots as a stretcher bearer. 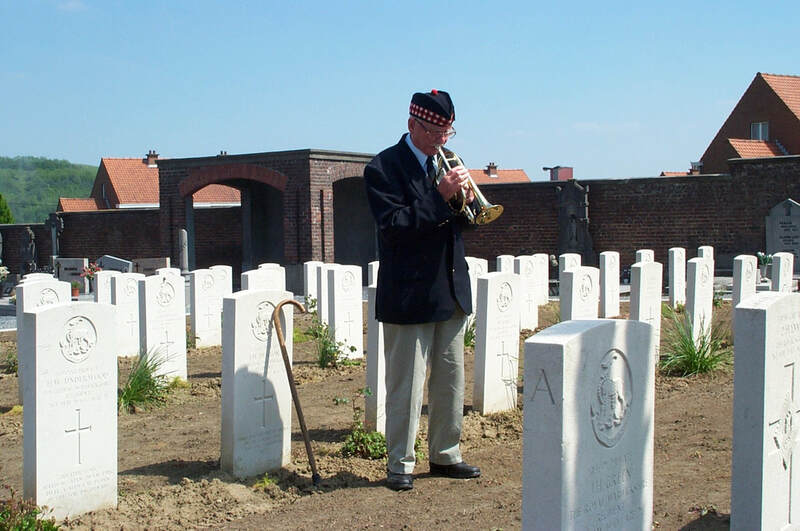 He was at Le Paradis when The Royal Scots came under severe fire from the SS Totenkopf and he was taken a prisoner of war. He was forced to march 300 miles through France, Belgium and Holland, followed by a three day rail journey in a crowded cattle truck with 50 fellow POWs. He eventually arrived at Stalag 8B Lamsdorf. In the camp he formed a dance band using instruments donated by the Red Cross and others bartered from Polish prisoners and German guards. ​In 1943 he was repatriated as a medic to assist with wounded British prisoners in their journey home. After the war he became Bandmaster of The Argyll and Sutherland Highlanders in 1949. In 1970 he was appointed Senior Director of Music (Guards Division) and was responsible for organising music for the Trooping of the Colour, the annual London Cenotaph Armistice Parade and for providing orchestras for state banquets at Buckingham Palace and Windsor Castle. 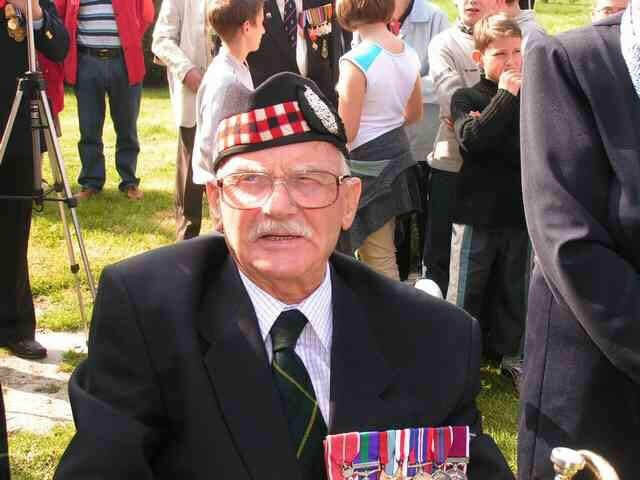 He was awarded an MBE for his services to military music. Major Howe retired from the army in 1974 and went on to direct concerts for the BBC. 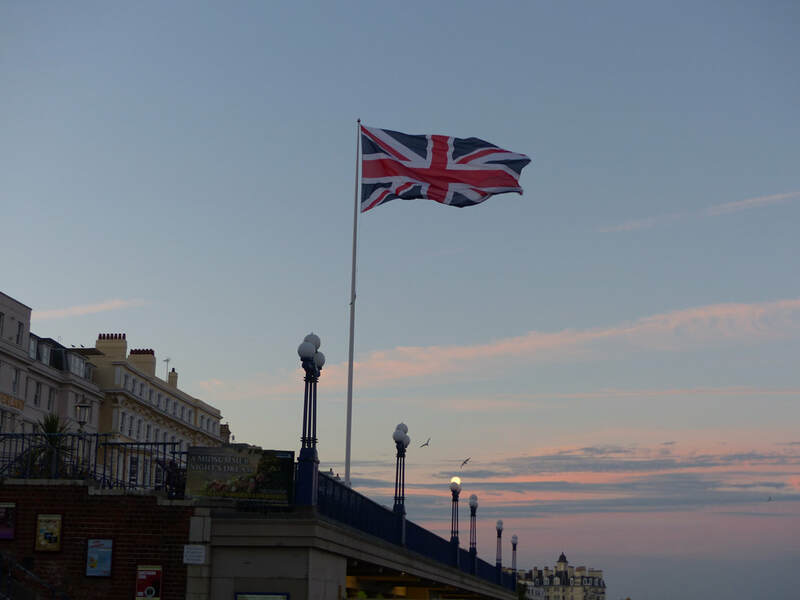 In 1983 he moved with his wife to Eastbourne on the south coast where he was closely involved in organising band concerts and was vice-president of the national ex-prisoners of war association and president of the Eastbourne branch of the Dunkirk Veterans' Association, amongst many other official positions. 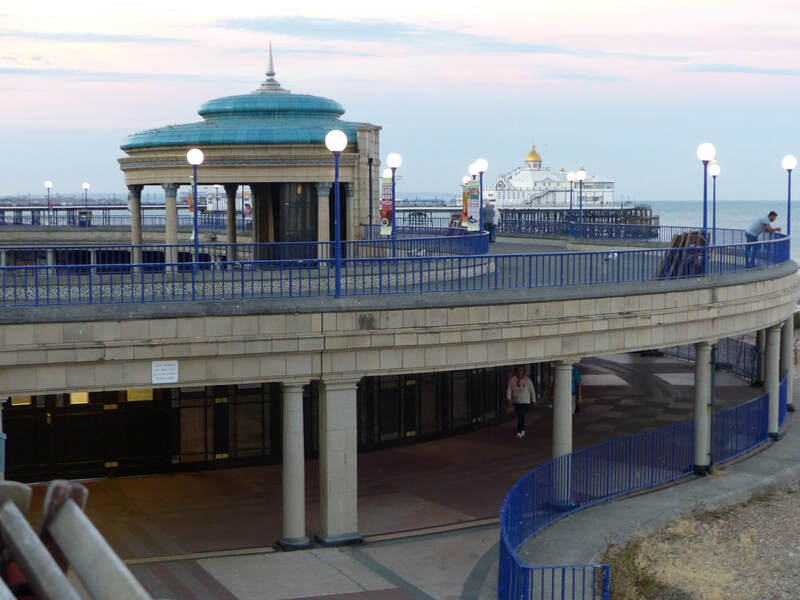 During the 1960s and 70s he brought The Scots Guards Band to Eastbourne for two weeks' of concerts each year. 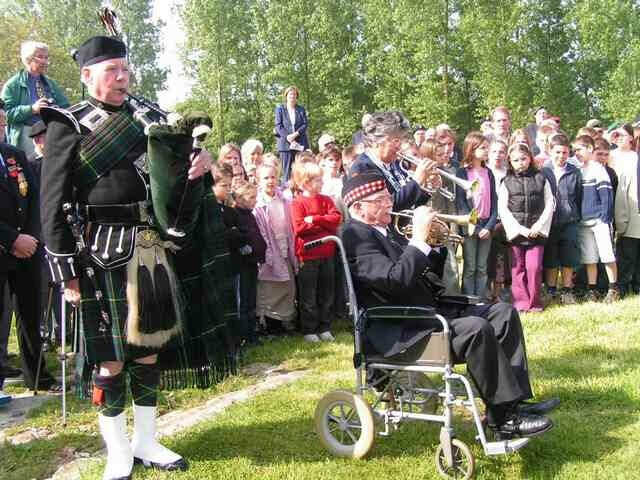 For many years he organised the attendance of Royal Norfolk and Royal Scots veterans at the annual commemoration events in Le Paradis. In 2002 his autobiography "A Conductor's Journey" was published. He died at the age of 87 in 2005. 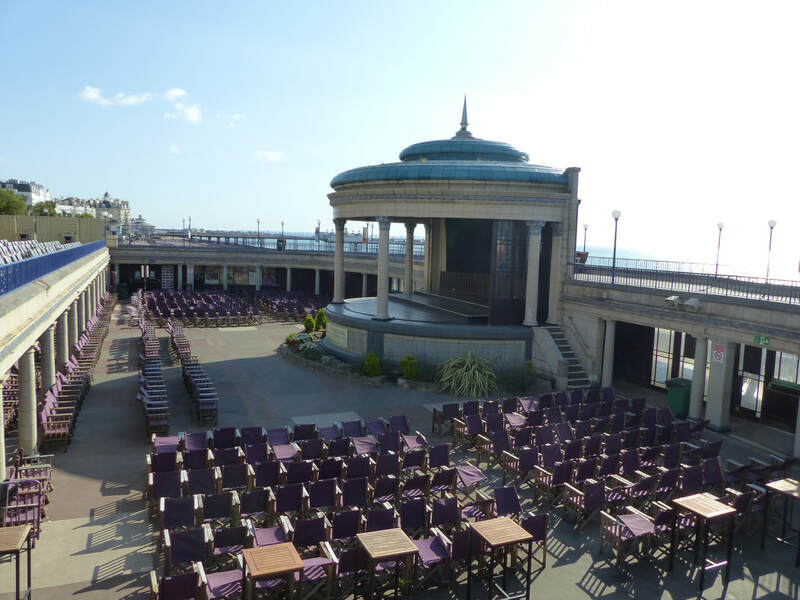 Photographs of Eastbourne Bandstand where Major Jimmy Howe produced annual band concerts. Photographs taken by John Head. The report above is from the private collection of Bob Brown and was written by Jimmy Howe who refers to himself in the third person. The report is reproduced with the permission of both Bob Brown and Jimmy Howe's son Alan. You can visit Bob's own page by clicking here. Bob and Jimmy exchanged these reports on one of the pilgrimages to Le Paradis.